The GBT Hotel Concept with GBT-UV45 solution treats water for human consumption with water quality following the quality requirements of the WHO. This in-house concept can be applied to larger needs of safe drinking water such as in the entire hotel, school, health centre, hospital, or office. It eliminates 99.99% of bacteria, viruses and chlorine-resistant parasites such as Cryptosporidium and Giardia. 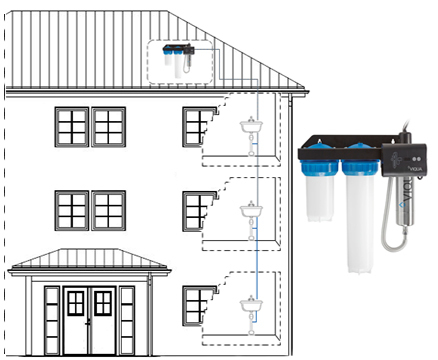 The water passes first through two different cartridge filters consisting of a particle filter and an active carbon filter. Thereafter the water passes through a UV aggregate type UVMax D4.